This temporary installation in Toronto is made of exactly 37,565 pieces of wood, each representing a Hungarian refugee who fled communism after the 1956 Hungarian revolution and settled in Canada. 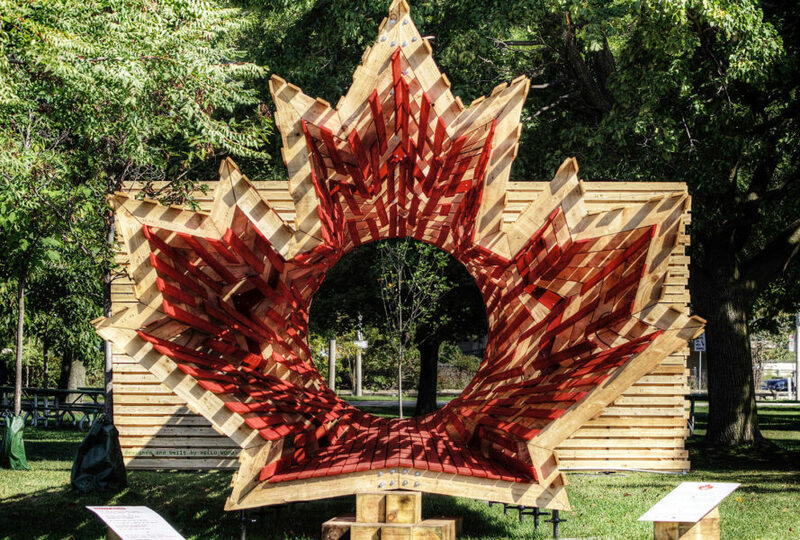 The Tunnel Through Time installation, designed and built by Hello Wood, combines elements of the Hungarian flag with Canada's national symbol, the maple leaf, to celebrate tolerance in a time of great political turbulence. The structure was designed to honor victims of the Hungarian revolution, but also recalls the turning point in Canadian immigration policy that shaped the country’s open-minded attitude towards immigrants in general. After the 1956 revolution, Canada welcomed 37,565 Hungarian immigrants, including 200 young engineers from the Faculty of Wood Sciences at the University of Sopron, who made a significant contribution to the famous Canadian wood industry. 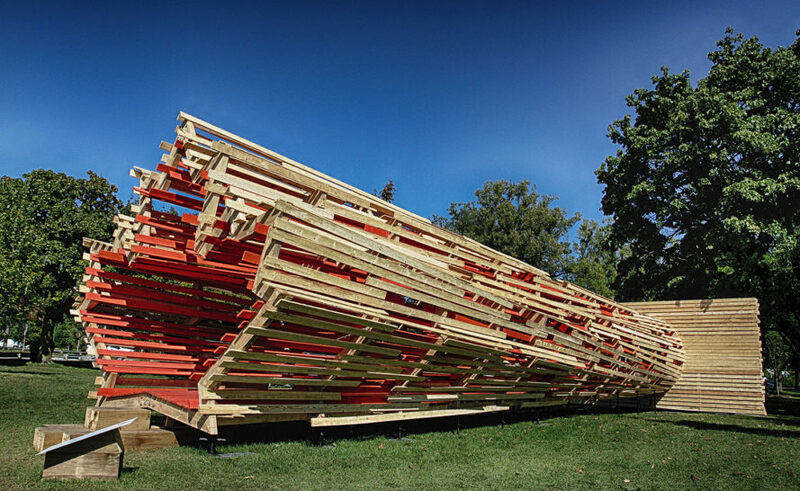 The Consulate General of Hungary in Toronto commissioned Hello Wood to design the installation. The studio sent eight people to Toronto and, with the consulate’s help, locals and Canadian Hungarians built the structure to include an entrance symbolizing events of 1956 and referencing the hole protesters cut in the middle of the Hungarian flag during demonstrations. The exit, on the other hand, symbolizes new hope and takes the shape of Canada’s national symbol, the maple leaf. The installation was planned to stay in Budapest Park for a month before being moved near to a spot near Niagara Falls, where it will remain in the custody of a Canadian Hungarian scout group. The Consulate General of Hungary in Toronto commissioned Hello Wood to design the installation. The structure aims to honor the victims of the Hungarian revolution, but also reminds of the turning point in the history of Canadian immigration policy that shaped the country's open-minded attitude towards immigrants in general. After the 1956 revolution, Canada welcomed 37,565 Hungarian immigrants, including 200 young engineers arriving from the Faculty of Wood Sciences of the University of Sopron, who made a significant contribution to the famous Canadian wood industry. The studio sent eight people to Toronto and, with the consulate's help, locals and Canadian Hungarians, who built the structure to include an entrance that symbolizes the spirit of the events of 1956 and references the hole protesters cut in the middle of the Hungarian flag during the demonstrations. The exit, on the other hand, symbolizes new hope and takes shape of the maple leaf, Canada's national symbol. The installation was planned to stay in Budapest Park for a month, before being moved to a spot near the Niagara Falls, where it will be in the custody of a Canadian Hungarian scout group. The structure was designed to honor victims of the Hungarian revolution, but also recalls the turning point in Canadian immigration policy that shaped the country's open-minded attitude towards immigrants in general. After the 1956 revolution, Canada welcomed 37,565 Hungarian immigrants, including 200 young engineers from the Faculty of Wood Sciences at the University of Sopron, who made a significant contribution to the famous Canadian wood industry.